Model D article about reclaiming materials from "deconstructed" houses. Sounds like there's a shortage of hardwood flooring, so that guitar makers and house builders compete for materials. Some government support is coming for promoting re-use of materials instead of just taking derelict houses to landfill. Winnie Imbuchi's blog about sustainable living in Detroit and her collection of links about elsewhere. Sam Butler, Saving Detroit's basements, one prairie at a time. Nov.8, 2013. Next City. "Detroit suffers from an aging pipe and sewer network that routinely cannot handle the amount of water that runs into its sewers after a heavy rain. In fact, the lack of sewer capacity causes millions of gallons of raw sewage to dump into the Rouge and Detroit Rivers every year. The Michigan Department of Environmental Quality estimates that Detroit released 456 million gallons of untreated water into rivers in 2012 alone." "....However, when a rain event (a jargony term for “storm”) occurs, the pipes overflow. Workers at the combined sewage holding facility then have a choice: Turn the valve one way and release raw sewage into the river, or turn the valve another way and flood people’s basements. Beyond residents’ ire, this has tremendous environmental and fiscal consequences. The Environmental Protection Agency heavily fines Detroit every time untreated water is released. It happened 27 times last year." "....The Greening of Detroit planted 7,000 trees last year and, according to Hay, a mature tree can soak up 5,000 gallons of water per year. Such reforestation projects go a long way toward keeping Detroit’s basements dry. In addition to trees, Hay is also spreading the vacant lots of Cody Rouge with his own special cocktail of prairie seeds." "We passed the city waterworks, a beautiful but decayed building on the Detroit River. The city wanted to regionalize the water system, [L. Brooks Patterson, Oakland County’s chief executive] said. “But the debt—why would I want to pick up a share of that? I had no responsibility for creating it.” Isn’t that where Oakland got its water? “Yeah, but I pay my bills,” he said. “So if they chose not to put the money into deferred maintenance, like they were supposed to all along—some of the pipes, the sluices, are still wood. They never upgraded them. Now, all of a sudden, they’re having problems and they want to give part of the responsibility to the suburbs? It doesn’t make any sense. They’re not gonna talk me into being the good guy. ‘Pick up your share?’ Ha, ha." Shea Howell, Water connections and Questions. Living for Change News, Oct.5 -12, James and Grace Lee Boggs Center. "Angela Davis [at the Without Borders Conference, Arcus Center for Social Justice Leadership]...urged all activists to think more deeply about the links and connections among struggles for justice everywhere. She talked about the global “war on everyday life” being waged as corporate powers increase their efforts to control land and water everywhere.....One such connection between Detroit and Palestine became immediately clear in the course of the conversation. We share the same water experts: Veolia. This company, now advising the city of Detroit on the future of our water operating land fills, buses, light rail trains, and water treatment plants, all supporting internationally condemned settlements." Shea Howell, New Culture Emerging. Living for Change News, Oct.26 - Nov.2, James and Grace Lee Boggs Center. 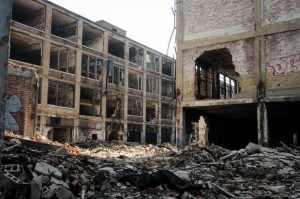 "The toxic values and practices of that old culture were on display this weekend before the whole world as the United Nations special rapporteurs on water and housing gathered testimony in Detroit. She also offered a strong indictment of the bankruptcy court, saying that bankruptcy proceedings do not exempt the city, state, or nation from its human rights obligations. In sharp contrast, the Duggan administration, demonstrated its moral bankruptcy. Sounding like every two bit dictator around the globe confronted by their failure to protect and honor the dignity of human beings, they claimed the UN didn't have its “facts” straight." Report from Detroit, Life Without Water. Circle of Blue. "Roughly 17,000 residences since March have had their water shut off because of overdue bills. Meantime, residents are pushing back, taking water from fire hydrants to drink, cook, bathe, and flush their toilets, and community leaders have organized emergency water deliveries." Individuals are interviewed. One woman says her yearly water bill is $4000. New York Times article, Dec.7 2014: Detroit by Air -- many photos. Metro Times "garden tour", giving names, addresses, contact info for twelve bigger Detroit market gardens. Shea Howell, Detroit as Global Test Drive. Living for Change News, Nov.2 - 9, James and Grace Lee Boggs Center. We who have resisted this process since the beginning have an enormous responsibility to make clear that Detroit Restructuring has been accomplished by cruel and unjust violations of human rights, from the shutting off of basic necessities to the shutting off of democracy. No one should think the closing of this bankruptcy is the end of the fight for a more democratic, compassionate future. Sue Halpern, The Creepy New Wave of the Internet. The New York Review of Books, Nov.20 2014. As an example, Rifkin points to Etsy, the online marketplace where thousands of “prosumers” sell their crafts, as a model for what he dubs the new creative economy. “Currently 900,000 small producers of goods advertise at no cost on the Etsy website,” he writes. Nearly 60 million consumers per month from around the world browse the website, often interacting personally with suppliers…. This form of laterally scaled marketing puts the small enterprise on a level playing field with the big boys, allowing them to reach a worldwide user market at a fraction of the cost. Etsy says its crafters are “thinking and acting like entrepreneurs,” but they’re not thinking or acting like very effective ones. Seventy-four percent of Etsy sellers consider their shop a “business,” including 65 percent of sellers who made less than $100 last year. While it is true that a do-it-yourself subculture is thriving, and sharing cars, tools, houses, and other property is becoming more common, it is also true that much of this activity is happening under duress as steady employment disappears. As an article in The New York Times this past summer made clear, employment in the sharing economy, also known as the gig economy, where people piece together an income by driving for Uber and delivering groceries for Instacart, leaves them little time for hunting and fishing, unless it’s hunting for work and fishing under a shared couch for loose change." "Ligher, quicker, cheaper" in Detroit (from the PPS newsletter).